There are now only 22 days till Christmas. Gift ideas anxiety? We too. “What gift her?” “What him”? “What i gave last year?” Oh god! I don’t have much time and so many things to choose! No worries: we help you. Here it is 5 gift ideas chose from our store thinking about you. The keyword is “warmth”. You will find our warm Peruvian wool knitting kits (of the highest quality and super warm) to create useful accessories to defend against the freezing winter. We have selected all the easy level knitting kits: we know that during Christmas, time is short and knitting should be a pleasure, not stress! So, take your time and have a look. Who knows, you can find the perfect gift idea! Somewhat neck warmer, a bit hood, Snowy Hood is an essential accessory to keep your shoulders, neck and ears warm… Made from our warm and super chunky Peruvian wool, Cool Wool, it is cozy and easy to wear in any occasion. 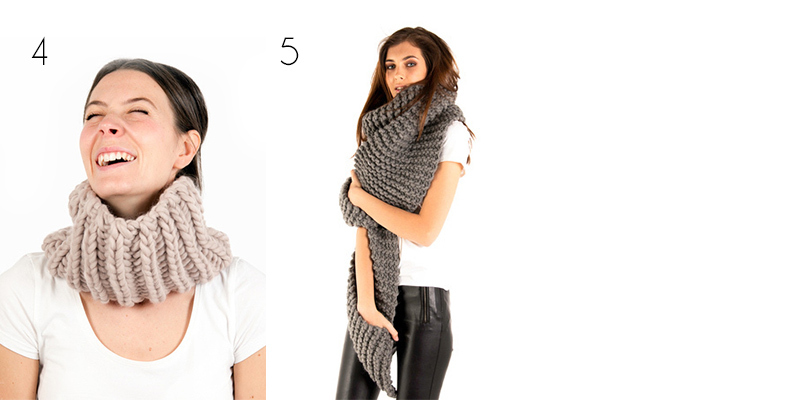 Available in intermediate level knit kit, choose the color that you like and wear it this winter for an extra warm! Made from our super warm 100% Peruvian Cool Wool, Tiptoe slippers will be the perfect fellows of your relaxation. A fabulously soft pair of socks to treat with care your feet after a day’s work! Made from our super soft and chunky 100% Peruvian Cool Wool, the Brioche Collar will finish off any of your outfit. It is the perfect accessory for the chillier months, whilst remaining stylish. Available as intermediate level knit kit, it will be fun to do it for him! Aileen Scarf is definitely XXL. Large, warm, enveloping, it keeps your hands warm instead of gloves! A scarf that fits all looks and women, men or children. It’s a must have to buy in each color! Available in beginner knit kit, it is made from our 100% Peruvian wool, Cool Wool, extra soft and chunky.